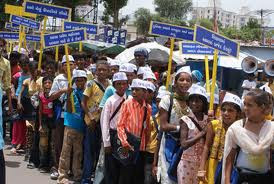 In a major exposure of the working of the Gujarat government, a right to information (RTI) reply to a senior activist has revealed that as many as 3,125 Dalit undergraduate students of Ahmedabad district alone have not been paid scholarship despite the fact that they were entitled to it. "The matter came to light after earlier attempts to get information through RTI on scholarship to Dalit students failed to yield result", said Kirit Rathod of the Navsarjan Trust, a Gujarat-based human rights NGO. Rathod said, "We demand from state social justice and empowerment minister Ramanlal Vora to provide complete details of how many students in other districts of not just undergraduate level but also school level have not been give scholarship and for how long." He added, the decision to file an RTI application was taken after the Navsarjan Trust received "large number of complaints" about students studying in different colleges failing to get scholarship. Despite the fact that the RTI application was filed three years ago, and an appeal was filed to Gujarat's information commissioner Balwant Singh on July 7, 2010, against the refusal of the state officials to provide information, indifference ruled about the issue all around. Even at the information commissioner's office the hearing took place only on April 4, 2013. "The reason for such a long time to hear the appeal provided to us was, the state information commission was not given enough staff to handle appeals, whose number was piling up with every passing year", Rathod said, adding, "Based on judgment of the information commissioner in our favour, we were able to get information only on May 15, 2013." Interestingly, the information provided, alleged Rathod, remained "incomplete", as it was only for Ahmedabad city and the district's several colleges of Sanand, Barwala, Dhandhuka, Mandal, Viramgam, Ranpur and Daskroi talukas and only for those who studied in degree colleges. No details of other districts has yet been given. "Whatever information we got suggested that as on March 31, 2013, as many as 1,613 Dalit students' applications had scholarship were pending to be cleared, while another 1,512 students were not provided with scholarship on account of lack of grants." Rathod estimates, "These students together have not been paid about Rs 3 crore as scholarship. If one adds the scholarship that needs to be given to students of primary and secondary schools, then it would multiply manifold. One has only to imagine what would have happened in districts other than Ahmedabad." These facts have come to light at a time when in Gujarat a lower percentage of SC children, especially girls, go to educational institutes compared to other districts. According to National Sample Survey (NSS) survey put out last year, among SCs, 71.2 per cent females in the age-group 5-14 were found to be attending an educational institution, which goes down to 18 per cent in the age-group 15-19, and further to 7.2 per cent in the age-group 20-24. Gujarat's percentage of sending 71.2 per cent of female SCs in the age-group 5-14 to an educational institution is lower than most states except Jharkhand (59.8 per cent). In the age-group 15-19, 18 per cent SC females go to an educational institution, which is lower than all other Indian states. And in the age-group 20-24, the corresponding figure for Gujarat is 7.2 per cent, which is worse than all states except Haryana (4.1 per cent), Jharkhand (2 per cent), Karnataka (5.3 per cent), Rajasthan 3.4 per cent) and West Bengal (4.4 per cent).